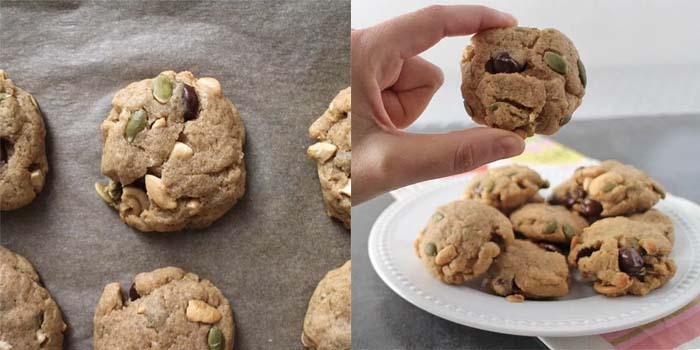 Make your sweet and easy Maple-Nut Cookies with whatever nuts or seeds you like. You can add chocolate chips, too, if that’s your thing! This recipe is basically a Choose-Your-Own-Adventure of Maple-Nut Cookies. In the recipe video and images, I used a mix of pumpkin seeds, cashews, and chocolate chips. Choose your own favorite mix-ins to make these cookies your own! The thing I love about these cookies, besides the recipe’s flexibility, is how quick they are to make. They only take about 22 minutes to mix, scoop, and bake. These Vegan Maple Cookies are made using white whole wheat flour. White wheat is actually a variety of wheat, and white wheat flour is pretty easy to find in most regular grocery stores. I prefer this type of flour for baking, because it brings a little bit of whole grain to these cookies, but the wheat taste is very, very mild. They do not taste like whole wheat cookies. If you’re having trouble tracking down white wheat flour, don’t worry! All-purpose white flour will work, as well. You can also mix half white flour and half whole wheat flour. See? Flexible! Let’s make some Maple-Nut Cookies! Maple syrup and a touch of brown sugar team up to give these cookies a sweet, earthy flavor. They’re perfect with a little crunch from the nuts/seeds. And if you like chocolate chips, go for it! You can use any combination of nuts/seeds/chips you like, as long as it adds up to 1/2 cup (8 tablespoons) total. If you do go for chocolate chips, I’d recommend not using more than 1/4 cup of them. I love chocolate, but too much in these cookies overpowers the maple flavor. In the video below, I use 2 tablespoons chocolate chips, 2 tablespoons pumpkin seeds, and 4 tablespoons cashew pieces. Make your sweet and easy Maple- Nut Cookies with whatever nuts you like. You can add chocolate chips, too, if that's your thing! ½ cup nuts of your choice or seeds! Or a mix of nuts/seeds/chocolate chips! I suggest not doing more than ¼ cup of chocolate chips, but you do you. Mix the flour, baking powder, and salt in a large bowl, and mix well. Set aside. Mix the wet ingredients, except the nuts, in a smaller bowl. Make a well in the center of the dry ingredients, and add the wet ingredients (including the nuts), mixing it really well. Scoop up the dough, 1 heaping tablespoon at a time, onto cookie sheets lined with parchment paper, spacing the cookies about 2" apart. Bake for 12 minutes on the top oven rack, and let them cool completely – at least a solid 10 minutes – before gently moving them over to a plate. If you can’t wait for them to cool, definitely use a spatula to move them to your plate, and don’t stack them until they’ve reached room temperature.